One of the aspects you want to look for in a pair of binoculars that will be used for hunting or nature watching is its ability to produce crisp, clear images. If you can’t clearly see an object at a distance the binoculars can quickly become a waste of money. Vanguard has designed these binoculars with ED glass lenses which will reduce any dispersion of colors so images are sharp and crystal clear. Easily identify species of birds at a distance, and enjoy panoramic views of nature that seem like it was right next to you. You will appreciate the 7 degree viewing angle and the 120m field of view at 1,000m. This lets you enjoy panoramic vistas without missing a single detail. The wide viewing range also makes it easier for you to be the first to spot a bird, which is always an advantage when you are out with a group. These binoculars also come with multi coated lenses that won’t reflect the light. 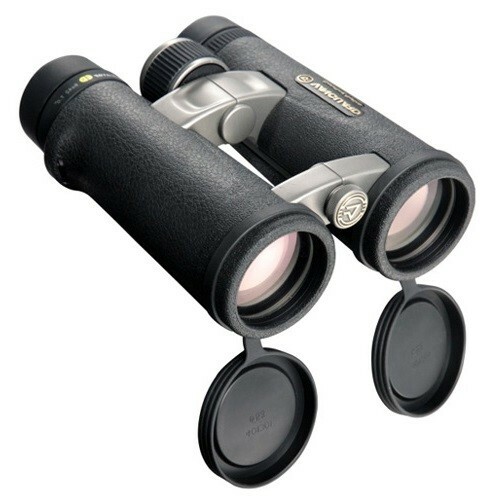 The roof prisms also makes these binoculars are great choice for use in low light. The lenses will increase the light so images appear bright and clear. Vanguard realizes that binoculars don’t have to be difficult to operate, and these are designed to be extremely easy to use. The convenient placed focus wheel lets you make tiny adjustments so you can easily bring objects sharply into view. While these binoculars are designed to be easy for beginners to use, experienced bird watchers and hunters will also appreciate not having to spend a lot of time focusing so they can concentrate on spotting a rare species. Even hunters and nature lovers need a pair of binoculars that are durable and comfortable to use. The Endeavor ED model comes with a sturdy construction that is backed by Vanguard’s unlimited lifetime warranty. This ensures complete protection against damage for as long as you own the binoculars. The tightly sealing O rings will prevent moisture and fog from clouding the lenses, and also ensures complete waterproof protection. The binoculars also come with an “open bridge” design that makes this pair incredibly comfortable to hold onto. Lightweight and durable, it’s easy to see why these binoculars are a popular choice with hunters. Not only are these binoculars affordably priced, but all of the necessary accessories comes with your purchase. The sturdy neoprene strap is wider than similar models. This provides additional comfort, along with the padded section. The rain guards fit securely over the eye cups and won’t be easily dislodged, and the binoculars also come with protective objective covers. There is also a padded case for convenient storage, and it also makes it easier to pack the binoculars with the rest of your gear. While some consumers have noted that the case is too small to store the binoculars unless the eyecups are folded down, it still offers excellent protection when you are traveling. The wide viewing angle ensures that you can see your surroundings, and the multi coating makes these binoculars are great choice for use in low light. Beginners and even experienced hunters will appreciate how easy these binoculars are to use. Designed for comfort and durability, there is very little not to like about these binoculars from Vanguard. Not only are these binoculars affordably priced, everything you need is included with your purchase. Some consumers have mentioned that there is some slight distortion when looking off to the side or viewing dark objects to the bright sky. While this can interfere with the clarity, this issue can usually be resolved simply by adjusting the focus wheel. If you are just starting out hunting and need a pair of inexpensive binoculars or are an old pro who simply wants a pair that is easy to use, these might be exactly what you are looking for. Manufactured by Vanguard, who has 26 years of experience designed binoculars, sights and other optics, you can rest assured that you are getting a quality product. For added assurance these binoculars also come with Vanguard’s unlimited lifetime warranty. The large focus wheel makes adjustments easy, and you will also appreciate the comfortable “open bridge” design. The ED glass lenses ensure the images are bright and crystal clear, even in low lighting. The multi coated lenses also help to minimize refractions and keep colors vivid and true to nature. With a durable water and fog proof construction, along with tightly sealed O rings you never have to worry about the lenses clouding up. Perfect for use in a variety of settings, these might be the perfect pair of binoculars for your next hunting trip.